Having an architect husband adds a certain, shall we say, dimension to travel. We seek out both iconic and obscure sites, and when we get home it seems like we have more photos of buildings and building details than we do of ourselves. Although over the years, I’ve developed a deeper appreciation for the way of the architect, and find myself noticing more details and wanting to understand more about a building’s site, construction and historical significance. It helps that I took 2 semesters of architecture history in college as part of my Italian minor. 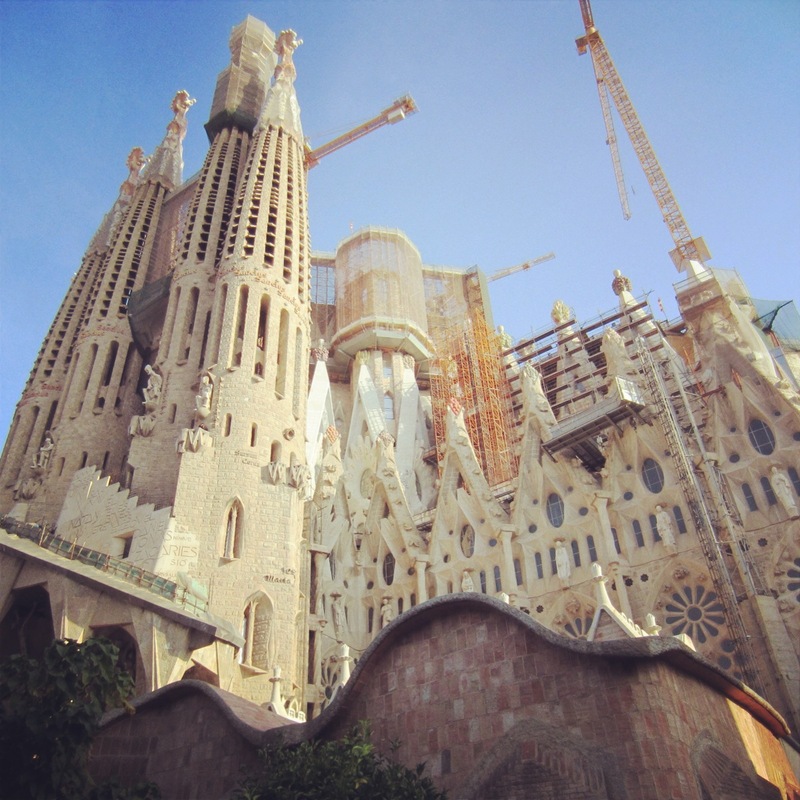 So when we went to Barcelona last fall, we were both in agreement that seeing the works of Gaudí and other Modernista architects was at the top of our list. Here’s how we covered some of the highlights in half a day. The “Holy Family” church is one of the most popular sites in Barcelona, so we decided to start here early. If you take nothing else from this post, I recommend buying you tickets online in advance or else you’ll end up waiting in line for hours. I repeat, BUY YOUR TICKETS IN ADVANCE! The Sagrada Família is considered Gaudí’s masterpiece, although he would never live to see it finished. Construction began in 1882 and Gaudí worked on it until his death in 1926. Today designers continue to bring his vision to life with a target completion date of 2026 – just in time for the centennial of Gaudí’s death. The church’s organic curvature and highly-decorative ornamentation make it a prime example of Modernista architecture. Its exterior has 3 distinctive façades that chronicle the life of Christ and only a few of the soaring spires that will top the final building (the tallest ones aren’t even in place yet). As impressive as the exterior is, the huge interior was like nothing I’ve ever seen before. The typical Latin Cross floor plan is bright and airy with flora-inspired columns and stained glass windows that cast rainbows of light throughout the church. After exiting the church, the museum is not to miss. It’s filled with original models and sketches that chronicle the church’s construction, as well as a “living workshop” where designers continue to build models using 3D technology. Another unfinished Gaudí site is his never-realized housing development Park Güell. I think we took the most obscure route to get there (a combination of metro, uphill walking and escalators to reach the rear entrance), but it was worth the trek. Located on the outskirts of the city, the park is more “natural” as compared to Gaudí’s other urban sites. Gaudí himself actually lived here for 20 years in a little pink house (which he ironically didn’t design) that has since been turned into a museum. 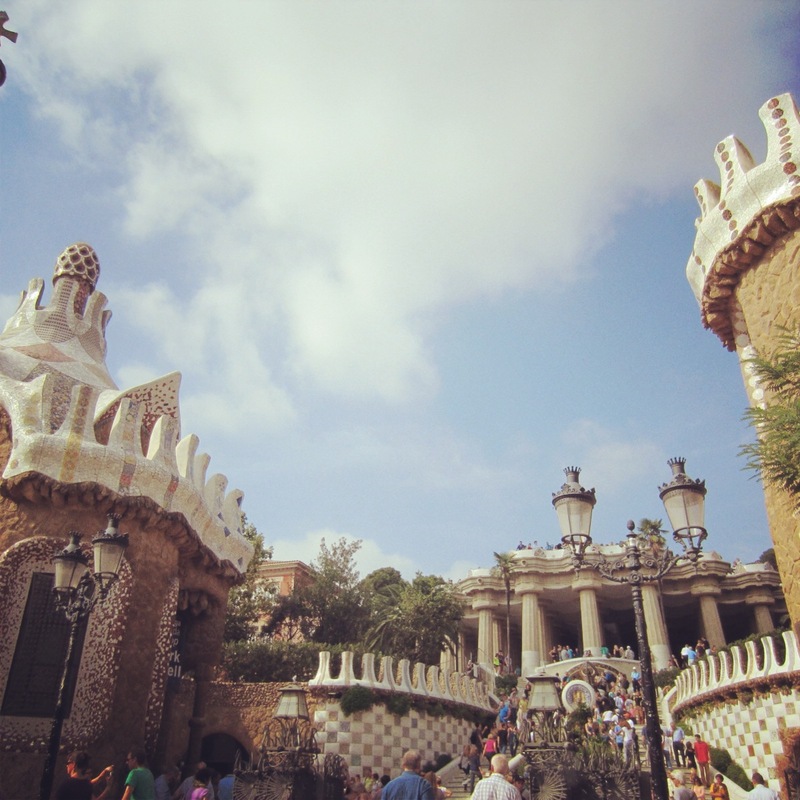 Park Güell’s front entrance is flanked by 2 gingerbread-like houses, which part to reveal a dragon-guarded staircase leading to the would-be market for the community. After weaving through the forest of columns, we climbed even higher to the terrace to take advantage of the unobstructed panoramic view and ergonomically designed mosaic benches. Although not quite as elaborate as I expected, the park proved to be the perfect spot to recharge before heading to our next destination. After about a half-hour walk we reached Gaudí’s iconic Casa Milà. Nicknamed La Pedrera (meaning “the quarry”), its unmistakable wavy stone exterior with wrought iron balconies sort of reminds me of a cliff dwelling. 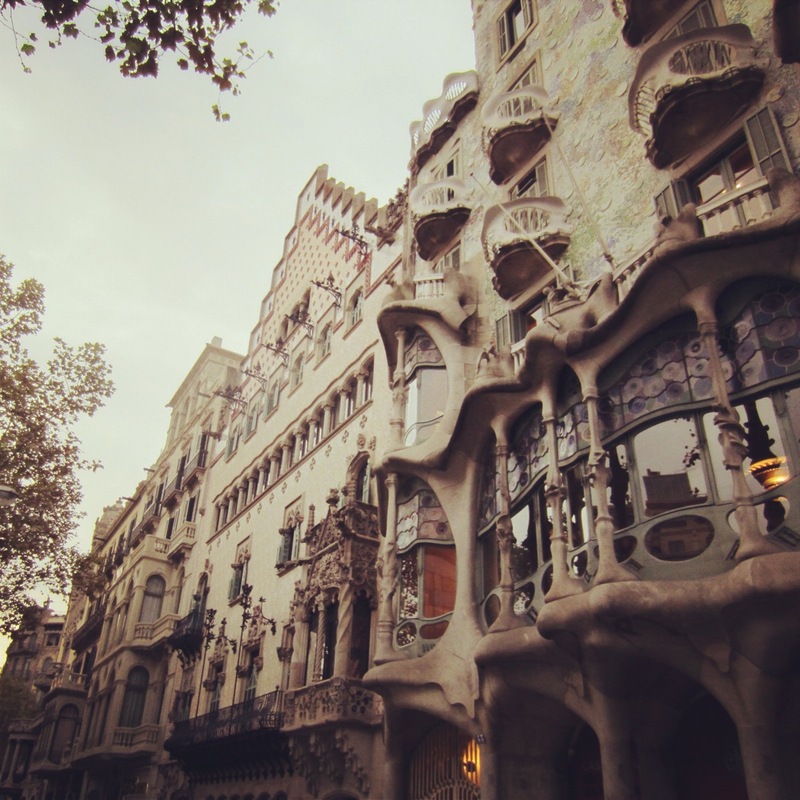 Built from 1906-1912 (while Gaudí was also working on Sagrada Família and Park Güell), Casa Milà was originally designed as a middle-class apartment building to anchor the Passeig de Gràcia neighborhood in the up-and-coming Eixample. Despite its harmonious appearance, Casa Milà is actually 2 apartment buildings with 2 interior courtyards that form a figure-8. Architecturally the building is significant because of its self-supporting stone façade with steel arches and pillars in place of any load-bearing walls, along with large openings that deliver light to every apartment. 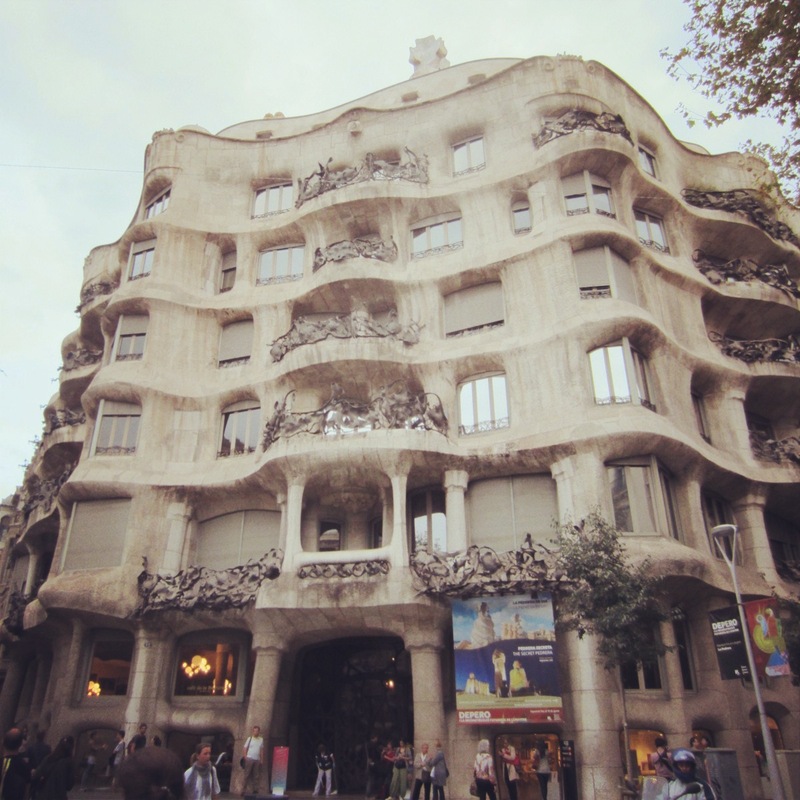 Gaudí also designed the site to promote a sense of community, from the balconies and courtyards to an impressive rooftop and lifts on every other floor of the 9-story building so residents had to interact with each other. Your ticket gives you access to the apartment, attic and rooftop, although a little short on time, we skipped entry and headed next to the Bock of Discord. Starting with Casa Batlló at #43 (another Gaudi work), this house features a playful dragon-like roofline and mosaic tile façade that looks like something right out of a Monet water lilies painting. Next is Casa Amatller at #41, which was designed by Josep Puig i Cadafalch for a chocolatier and his family and coincidentally resembles a gingerbread house. Its façade evokes Moorish design elements, and if you look closely you’ll notice the letter “A” woven throughout the design, including its pointy roof. The next 2 houses, Casa Bonet and Casa Mulleras, are slightly less elaborate, and are followed by Casa Lleó-Morera at #35. Designed Lluís Domènech i Montaner, this elegant corner house looks like a theatre with its ornamented balconies, and shares many similarities with Montaner’s Palau de la Música Catalana concert hall near the old city center. Our day ended here, but if you want more modernista architecture, check out the comprehensive list of sites here. Wow! This needs to go on the list. That church is amazing! Absolutely Lesley! It’s like nothing I’ve ever seen before, so amazing!